Korean Beauty- Easy way to tame dry, brittle, color treated hair like mine! Hey people around the world! So if you’ve seen a picture of me I have very light colored hair that my hairdresser blessed me with. Yeah it’s so not natural… but I love it. Nevertheless, I have to deal with the consequences of bleaching and dying my hair. From far away it looks good but up close it’s a mess. If you touch it, it feels like hay. Anyway, I usually do a treatment conditioner once a week in the shower to smooth and nourish my hair but my hair was feeling extra dry the last couple days from heat styling so I went and got the Kocostar Home Salon Hair Pack from Olive Young for about 4,500KRW, I don’t remember the exact price. This is a Korean beauty brand that specialises in different kinds of face and body packs. For those of you who are confused my the word ‘pack’ I’m talking about beauty masks, facial sheets, etc. I first found out about this brand on Instagram and while I was shopping around I saw it and decided to try it out. For the sake of beauty! So now I’ll show you how to use the pack and the results! First you have to shampoo your hair and squeeze out the extra water. I gave my hair a quick squeeze with a towel to make sure I wouldn’t have any drippage. Afterwards, place the cap on your head and tuck in the hair into the cap. It can get a little snug, I actually ripped a little bit in the center by accident. I think for long hair you can tie it up loosely or put the cap on with your head down and placing the hair inside first and fitting on your head. Then take the backing off the sticker and pull to tighten the cap on your head. 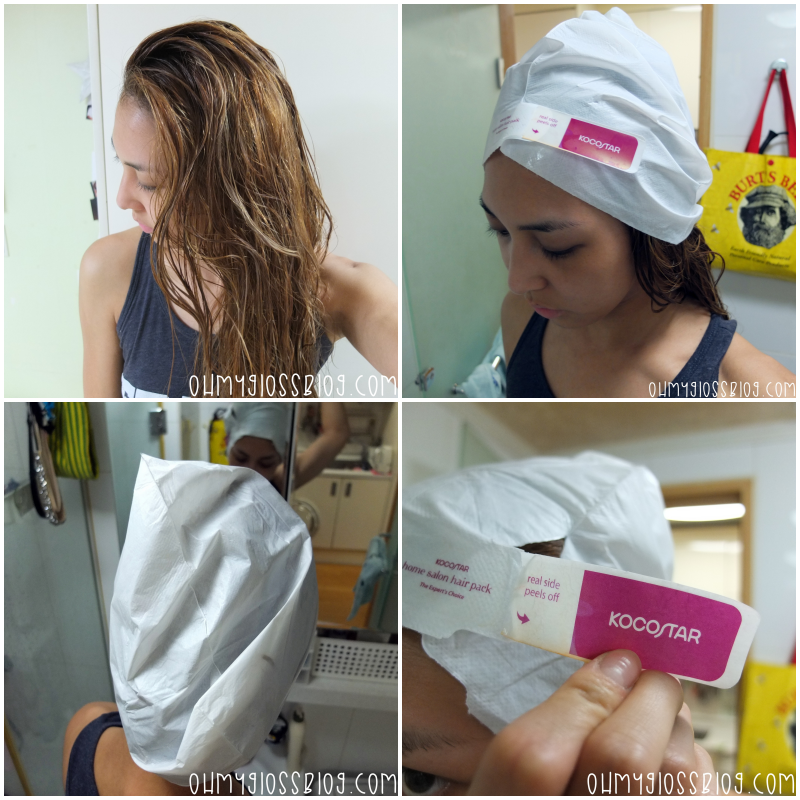 Then massage the contents of the cap to your scalp and hair then wait for about 15-20 mins. I wrapped my hair in a towel because the sticker was a bit loose because there was some product residue on the outside of the cap. Afterwards, rinse your hair with warm water and dry as desired. I towel dried my hair and then gave it a cool dry with my hair dryer. The results were pretty good. I could brush through my hair without tugging and my hair was very relaxed and moisturized. Even after sleeping, the next morning my hair didn’t have any tangles and felt silky. My scalp didn’t feel oily either throughout the day. It might not look that great, but to me it did a decent job smoothing the ends of my hair. I’ve tried similar hair packs before like the one from Etude House Silk Scarf Double Care Hair Treatment (3,500KRW). If you’re looking for a quick way to treat your hair with out breaking the bank check it out. You can go to www.kocostar.com for more information and where you can get it. They seem to have stores/distribution centers in different countries. Previous article Easy As 1,2,3- How to Look Like a Bronzed Goddess!